Location: The hotel is situated in the centre of Shumen city. Shumen Fortress is 3 km away. The first two capital cities of Bulgaria – Pliska and VelikiPreslav – are located very near, as well as the “Madara horseman” monument – carved into the rocks above Madara village many centuries ago, the monument which Bulgarians chose as the symbol of their country. 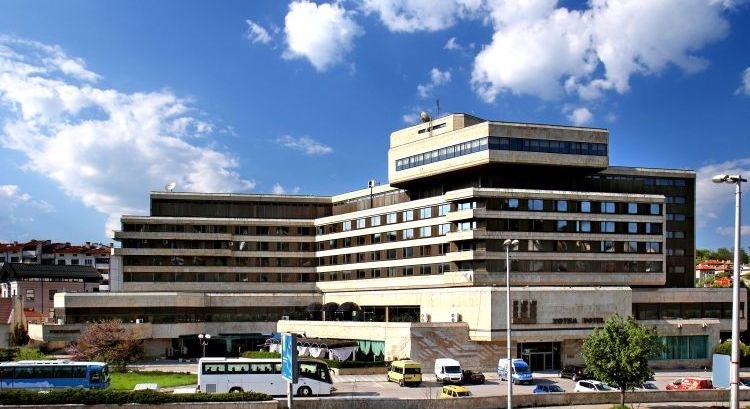 Accommodation: Grand Hotel Shumen has 51 standard+ rooms, both in single and double occupancy. The luxury rooms have been completely remodeled with an emphasis on style and functionality. Grand Hotel Shumen includes luxury rooms, some of which are furnished with two separate single beds. The luxury suites have been completely remodeled with an emphasis on style and functionality. Hotel Shumen has 2 luxury suites. The newest category SUPERIOR rooms are fully renovated in 2013. They are elegantly furnished, cozy and extremely comfortable. In the hotel: Viennese pastry shop, "Old Shumen" tavern, Restaurant Shumen, Restaurant Panorama, 24-hour reception, Wake up call service, 24-hour room service, Closed and open secure parking, Message delivery service, Luggage storage service, Payment by credit card, Laundry and ironing service, 24-hour internet access, Sauna, Massage, 25m X 12,5m temperature-controlled indoor swimming pool with a qualified lifeguard on duty. Pool is open from 1 May to 30 October.